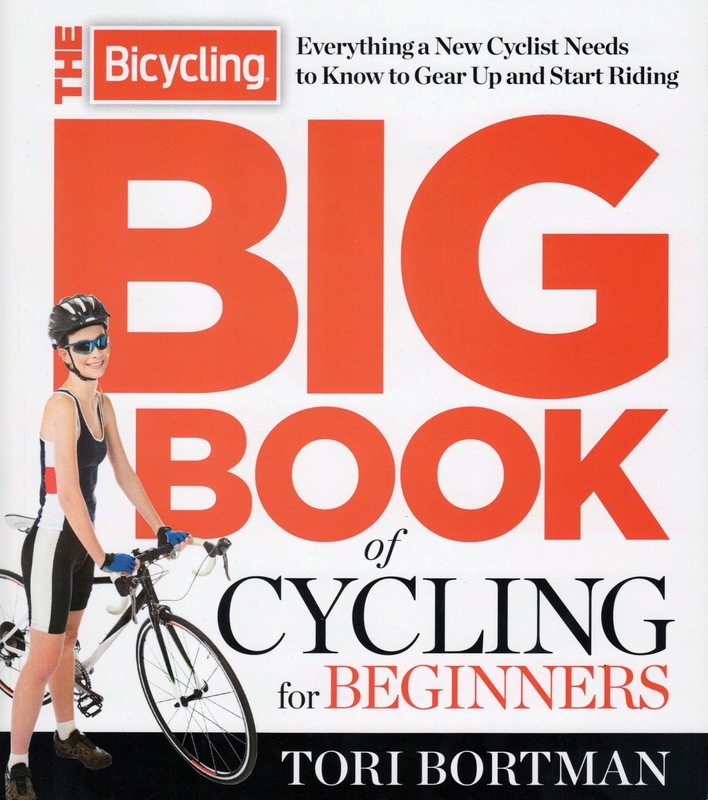 We recently received an advance copy of "The Bicycling Bike Book of Cycling for Beginners" by Tori Bortman, scheduled for publication on June 3. The book is a guide to getting started with "road" cycling. If you are just starting out riding a bicycle and you want to learn more about all kinds of cycling, this is not the best book for you. If you are interested in road cycling, the book contains some good information, including what to consider when purchasing a road bike, bike fit, clothing, riding skills, nutrition, and riding with a group. Finding the Right Ride covers the type of riding you want to do. Three types are mentioned: The Recreational Rider, The Fitness Cyclist, and The Racing Cyclist. Touring, commuting, and everyday riding are included under recreational riding. The author notes that any bike will do and you don't really need special clothing and gear to have fun or to commute, but the remainder of the book is mostly geared toward more competitive cyclists. The sections on purchasing a bike cover frame materials, fit, the importance of test riding, women-specific bikes, and upgrades and add-ons. It's noted that if you want to use your bike for transportation, most road bikes will not accommodate racks and fenders. While the use of panniers, saddle bags, and handlebar bags is mentioned, there's not much practical information included about transportation cycling or touring. The book includes information on basic bike maintenance and tools. Topics covered include cleaning the bike, rims, and chain, lubing your chain, and two chapters on preventing and repairing flat tires. Continuing with the road bike theme, only 700c tube sizes are discussed. There's no mention of hybrid, comfort, folding, cargo, trikes, or other types of non-road bikes. There is only passing mention of touring or recumbent bikes. Many, many cyclists ride non-road bikes. In fact, road bikes comprise only 20% of all bikes sold in the U.S. Hybrid and comfort bikes comprise 37% of all sales. The book illustrates the impact that competitive cycling has had in the cycling world. Magazines like Bicycling tend to cater to cyclists who want to ride expensive, lightweight road bikes meant for racing, to people wearing tight-fitting bicycle-specific clothing. That attitude is slowly changing. In recent years Bicycling has included more articles about urban cycling, using cargo bikes, and general transportation cycling. A book that takes the complete opposite approach is Just Ride by Grant Peterson, of Rivendell Bicycles. "My main goal with this book is to point out what I see as bike racing's bad influence on bicycles, equipment, and attitudes, and undo it… I think of the process of questioning racing's ways, and coming up with more livable alternatives, as unracing." The title of his book says it all; just ride without the need for a special bike, clothing, shoes, or other special equipment. Overall the book contains some good advice for beginning road cyclists. If you've always wanted to know more about road cycling, purchasing a road bike, training for an event or race, and nutrition, then this book may be for you. However, I'm concerned that people who are interested in starting to ride, real beginning cyclists, may not find the information they need. For someone who would like a more general guide for the beginning cyclist, another option is Smart Cycling: Promoting Safety, Fun, Fitness, and the Environment by Andy Clarke of the League of American Bicyclists. Note: An earlier version of this review contained quotes from The Big Book. Since the book has not yet been published, the text of the quotes could change so those quotes were deleted from the review.